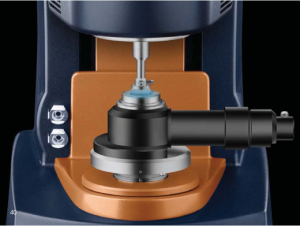 The UV curing accessory allows for room temperature characterization of cure Kinetics for UV active materials in the 320-500nm range on the DHR3 Rheometer. It consists of a mercury vapor lamp and a light guide to direct light through a transparent lower plate onto the sample. Optical filters allow specific measurement at 365nm and band pass at 400-500nm. Output intensities up to 300 mW/cm² are possible. Geometry options are limited to a 20mm disposable aluminum upper plate and quarts or acrylic lower plate. 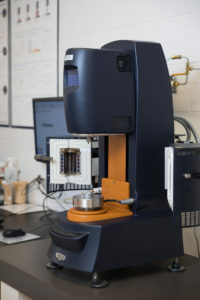 This fixture was also purchased in conjunction with a Photo Curing Accessory for use with our Q1000 DSC for acquiring complementary cure kinetics through calorimetry.